Awesome! You guys are gknna love these turtles! I have some reptiles myself and they are awesome pets! Is the editor really of the same species? 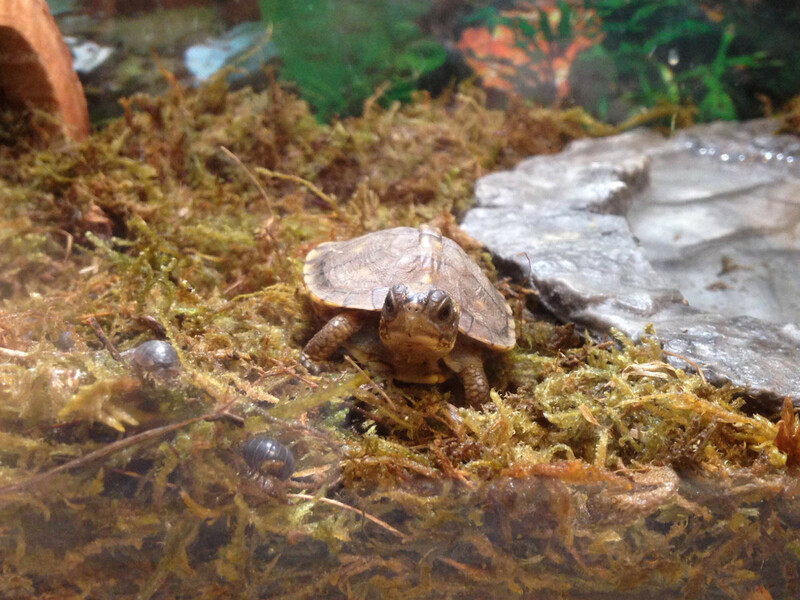 Carapace doesn’t look domed enough to be a box turtle. Yeah, they’re both Three-Toed Box Turtles, Terrapene carolina triunguis, out of the same clutch. 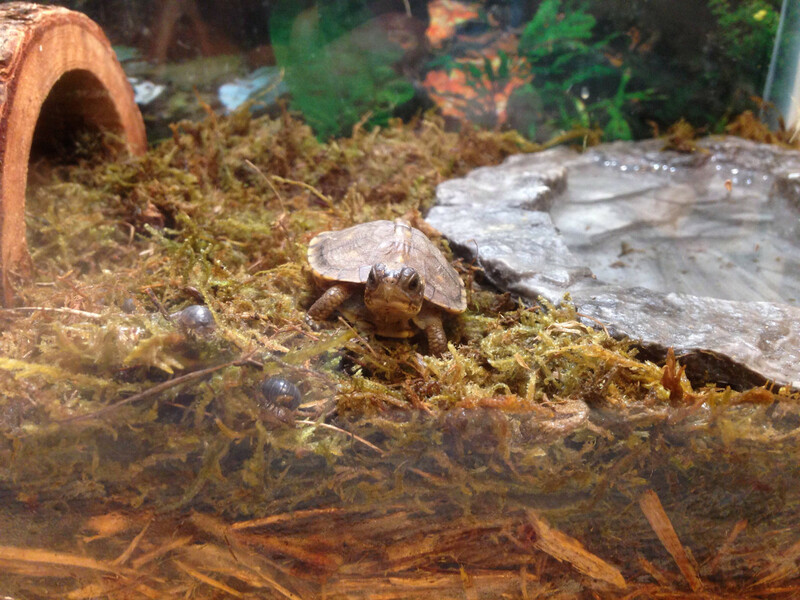 Shell shape is pretty common for baby box turtles, they don’t really dome up until later, IME in their second and third years. I’m not sure if there’s an adaptive reason for that or if it’s architectural or what. One possible benefit to having a flatter shell as a baby: baby turtles have short necks and since turtles that roll on their backs can usually flip over by pushing against the ground with their heads, having a flatter carapace makes it easier for the head to reach the ground. That may sound counterintuitive – you might think that a domed shell would be easier to roll off of – but in a lifetime of watching box turtles, the ones that had the hardest time turning over when upended were those with the highest shells. A pretty interesting paper (that I just discovered) that deals with this is “Geometry and self-righting of turtles” by Gábor Domokos and Péter L Várkonyi, which is free to access here. Turns out that tortoises with high domed shells mostly use dynamic motions of the limbs to flip over, flat turtles use their heads, and intermediate forms – including most box turtles – use a bit of both. 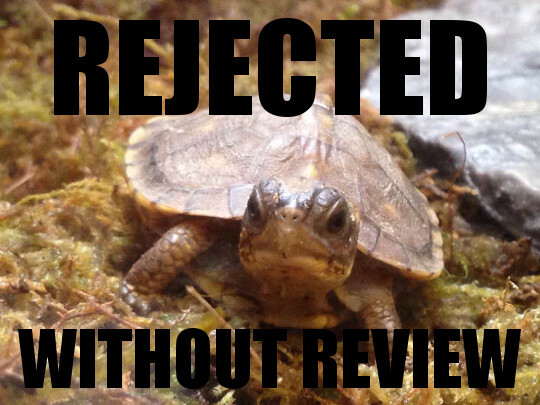 They even have photos of what looks like a Three-Toed Box Turtle – definitely a Terrapene carolina of some kind – doing the flip (Fig. 6C). 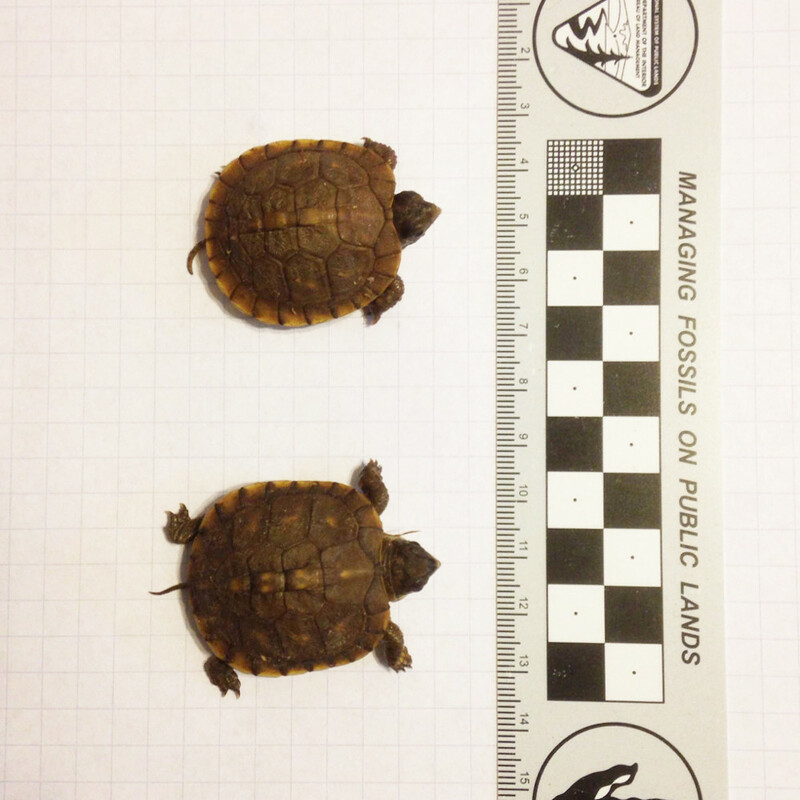 So here’s my hypothesis for baby box turtles: they have really big heads for their body size, and fairly small and weak limbs (at least compared to adults). That makes waving the limbs to turn over (tortoise strategy) less optimal and head-pushing (slider strategy) more optimal. And since their necks are short, they need flatter shells so their big heads can reach the ground. BUT keep in mind that last paragraph is just a bunch of adaptationist arm-waving from me. 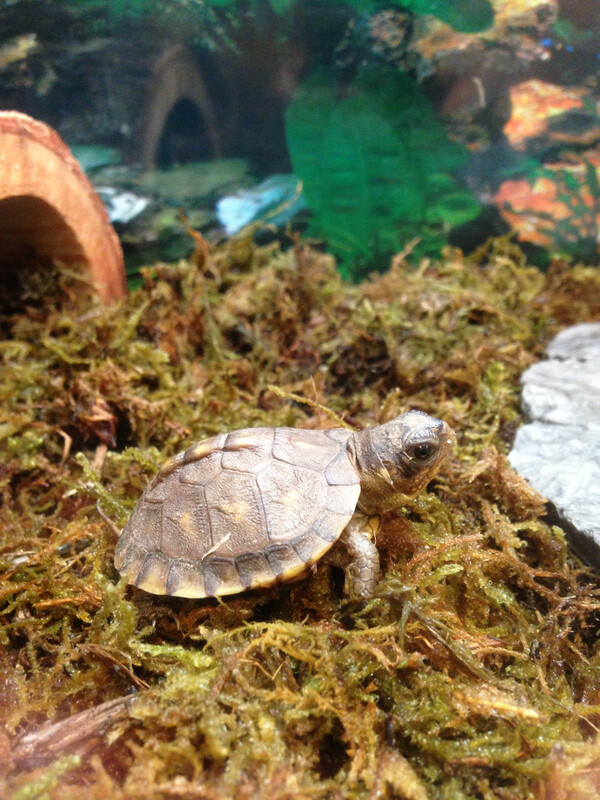 FWIW, a quick and entirely unscientific Google image search suggests that hatchling box turtles really do have flatter shells than baby tortoises, many of which seem fairly high-domed right out of the egg. 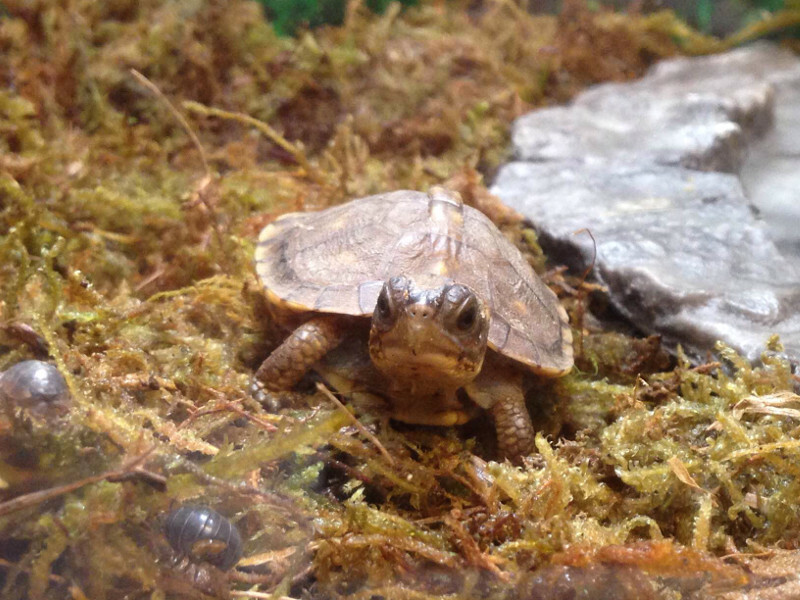 Another possibility: box turtles are basically secondarily terrestrial sliders (Emydidae) that have convergently acquired the tortoise bauplan, so the fact that their babies look like baby sliders is just recapitulation. I gather that adult box turtles CAN right themselves, but the one time, as a child, that I saw a demonstration, the box turtle the docent placed on its back just lay there looking helpless for what seemed like a long time… during which a young snapping turtle righted itself repeatedly: put it on its back and it wias right side up in seconds. I wasn’t there, so take this with a huge grain of salt, but I suspect that box turtle didn’t right itself just because it didn’t want to. Righting behavior involves extending the neck with the soft part facing up (toward danger), and all of the limbs, so it’s the maximally exposed state for a turtle. I have seen box turtles that were freaked out just sit in their shells, upside down, for up to half an hour until they were certain that they were in no danger. Keeping boxies as a kid was a good lesson in patience. I used to watch turtles for hours and hours.